The synthesis of alcohols from amine starting materials is an excellent yet challenging strategy for the preparation of pharmaceuticals and polymers. 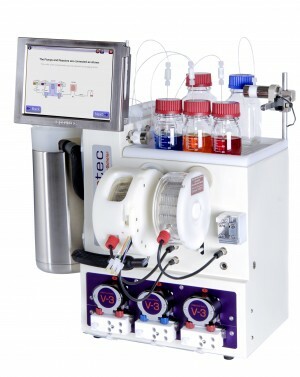 Here we developed a versatile, self-sustaining closed-loop multienzymatic platform for the biocatalytic synthesis of a large range of non-commercially available products in a continuous flow with excellent yields (80 to >99%), reaction times and optical purity of secondary alcohols (>99 enantiomeric excess). This process was also extended to the conversion of biogenic amines into high-value alcohols, such as the powerful antioxidant hydroxytyrosol, and the synthesis of enantiopure 2-arylpropanols via the dynamic kinetic resolution of commercially affordable racemic amines. 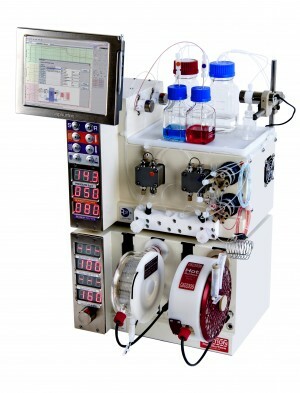 The system exploits the in situ immobilization of transaminases and redox enzymes which were combined to cater for a fully automated, ultra-efficient synthetic platform with cofactor recycling, in-line recovery of benign by-products and recirculation of the aqueous media that contains the recycled cofactors in catalytic amounts, which increases the efficiency of the system by over 20-fold.